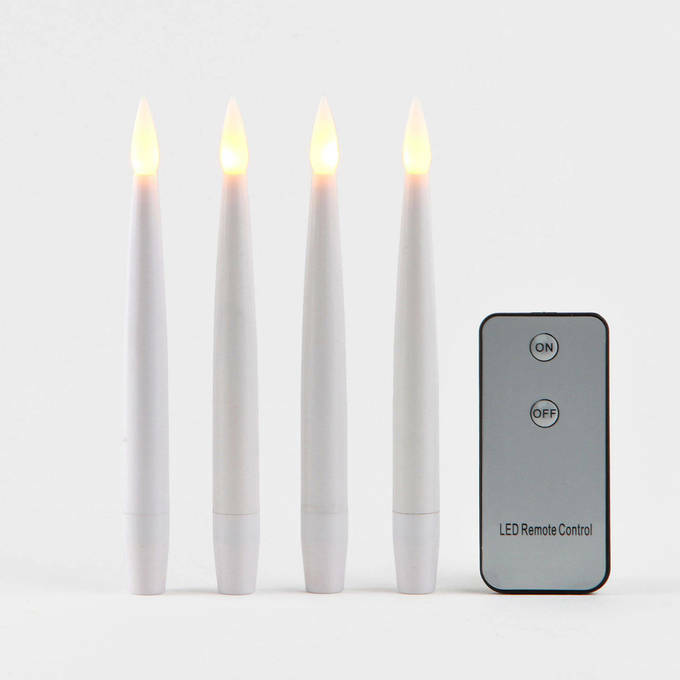 There are only 398 available of the Smooth White 6" Resin Taper Candles with Remote, Set of 4. Your selected quantity has been adjusted. 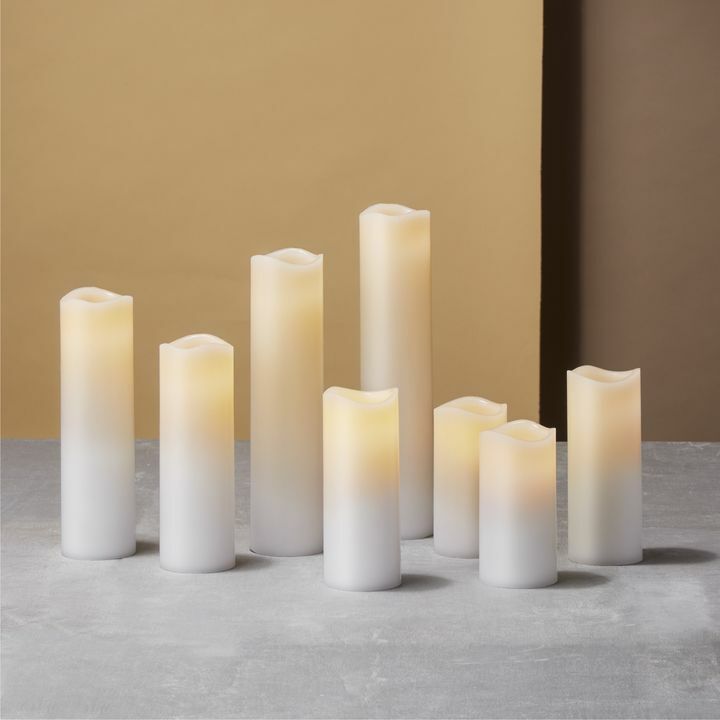 These sleek, white, flameless resin taper candles add warmth and sophistication to any occasion without the worry of messy drippings or open flame. 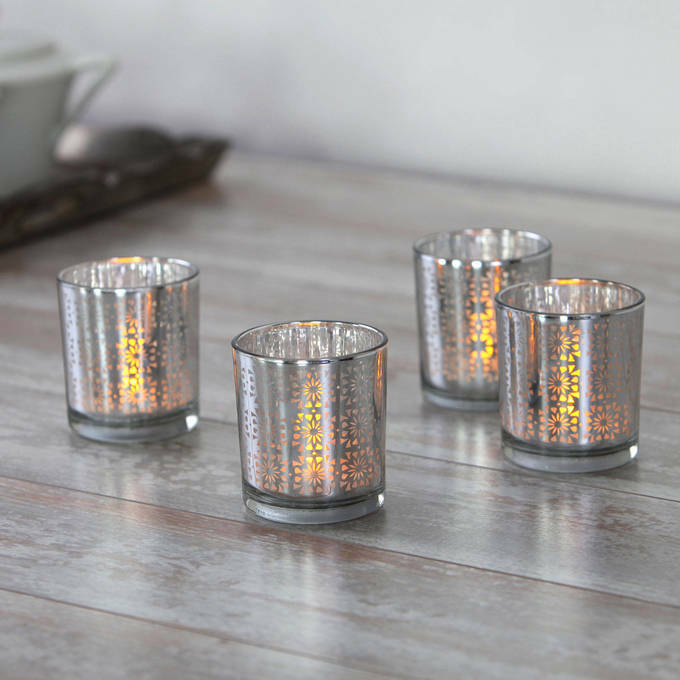 Let them compliment your holiday table or a romantic corner in your home or balcony. Perfect for home, weddings, churches, restaurants, and events. 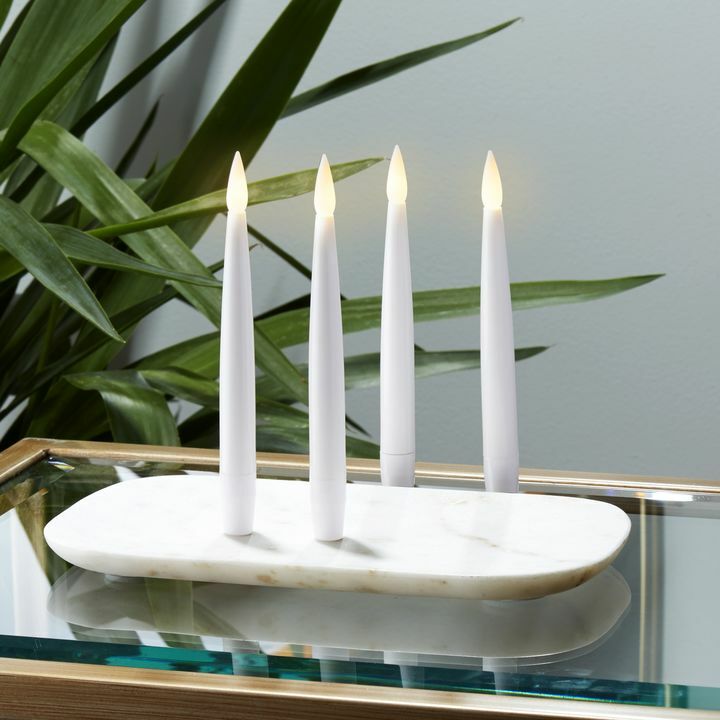 We really love the Candles, wax without the fire and heat. 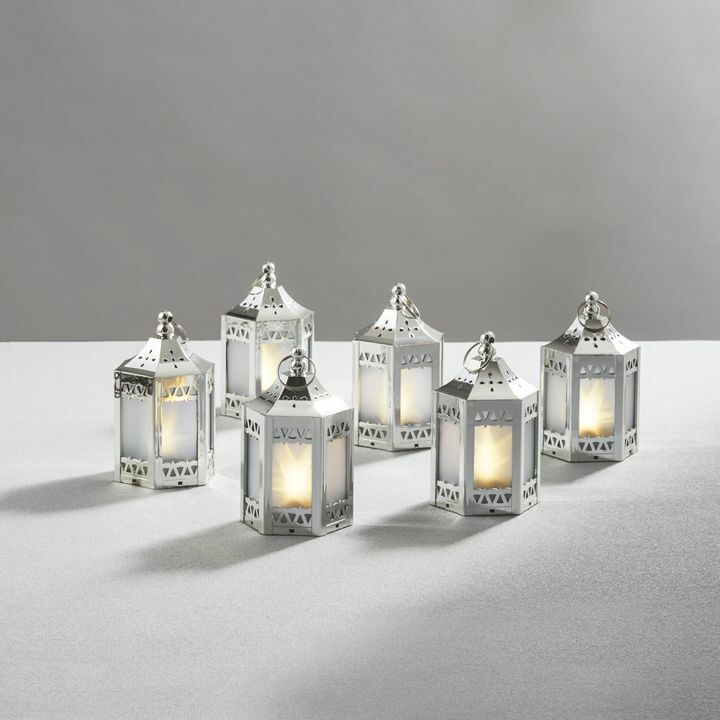 I like the product, nice lighting on the table but I cannot find candleholders for them as they are a very small size. I will keep looking. 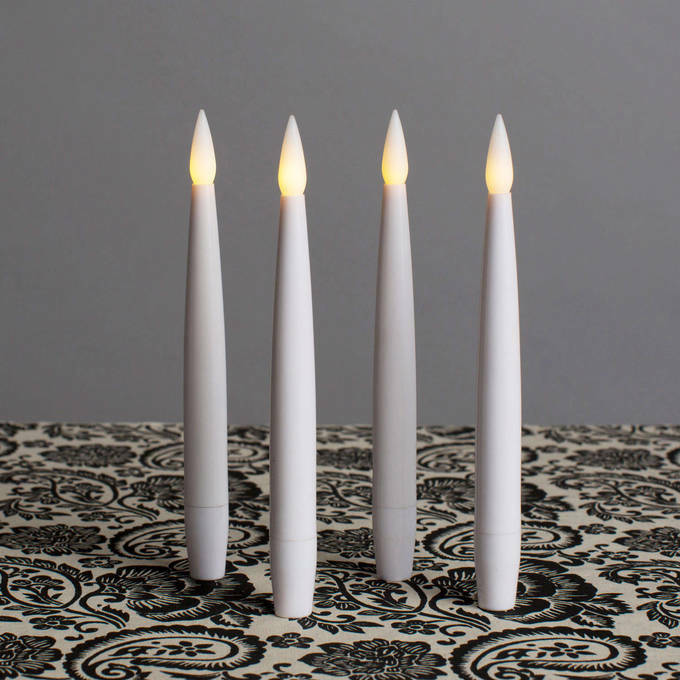 Set of four flameless taper candles including remote, 6" tall thin white. Nice but very thin. Will be a challenge to fit into average sized candleholders. So cute I'll keep them. I was in desperate need of 1/2" diameter candles for a performance. These candles fit perfectly and worked well. Batteries ARE included - a huge plus. The makers also had the foresight to include a buffer to keep the batteries from running down before you use them. The buffers were easy to remove and will keep my candles long lasting. I would buy them again without hesitation. 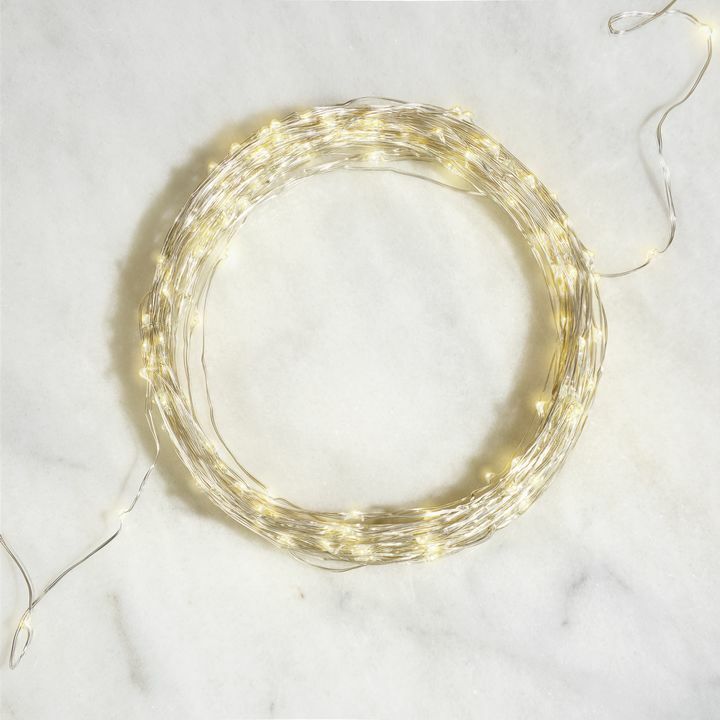 We are so happy with Lights.com. We needed a very specific dimension of candle and they were the only company to have them. The order was received promptly and well packaged. Couldn't be more pleased. Ordering a second batch today! 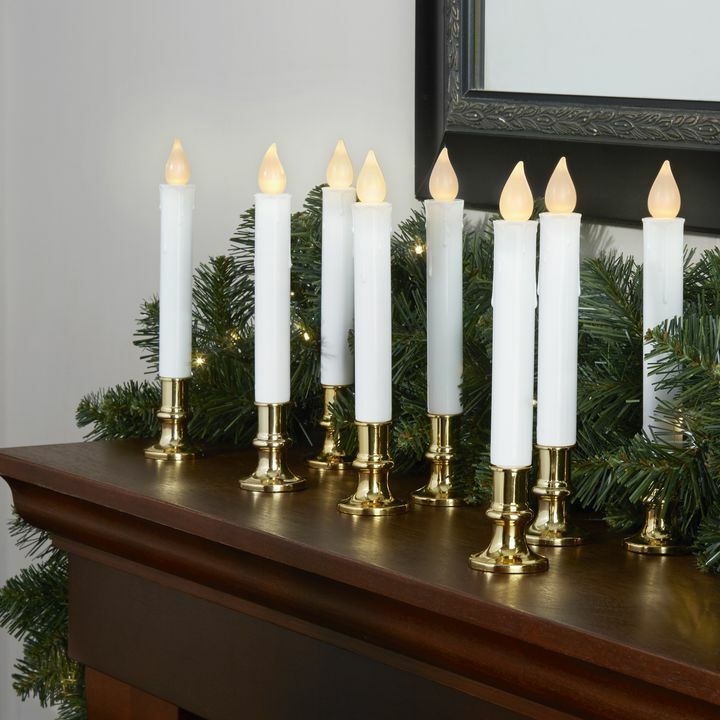 These were nearly as nice as real candles: I'd have rated them 5 stars instead of 4, except that the batteries that came with them were dead. The candles are perfect fir hard to reach places. Too bad they came with dead batteries. 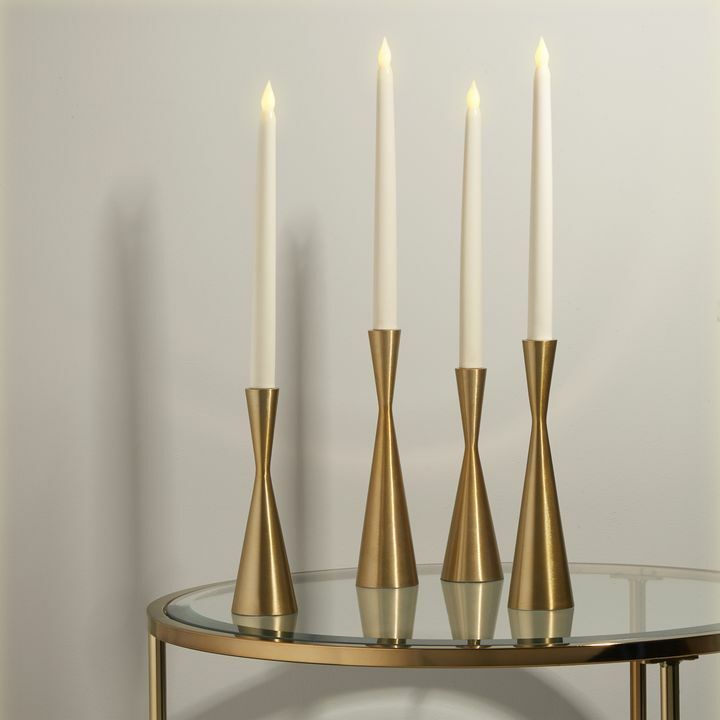 Do you have any candle holders that would hold these candles? Sorry, we don't have any that would work well with them at this time. 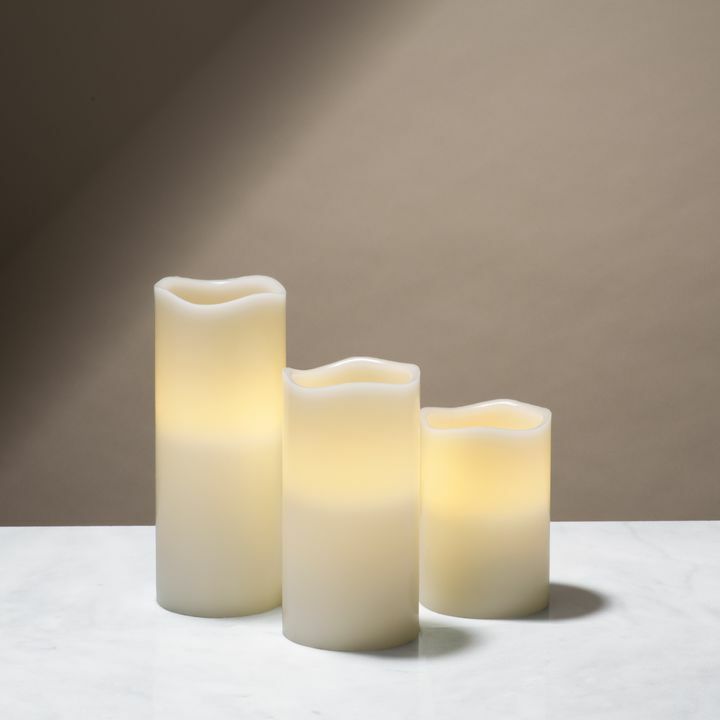 The Smooth White 6\" Resin Taper Candles are specialty candles and are very thin (only .5\" in diameter!). They're often used in mini candelabras, chandeliers, or other decorative elements. 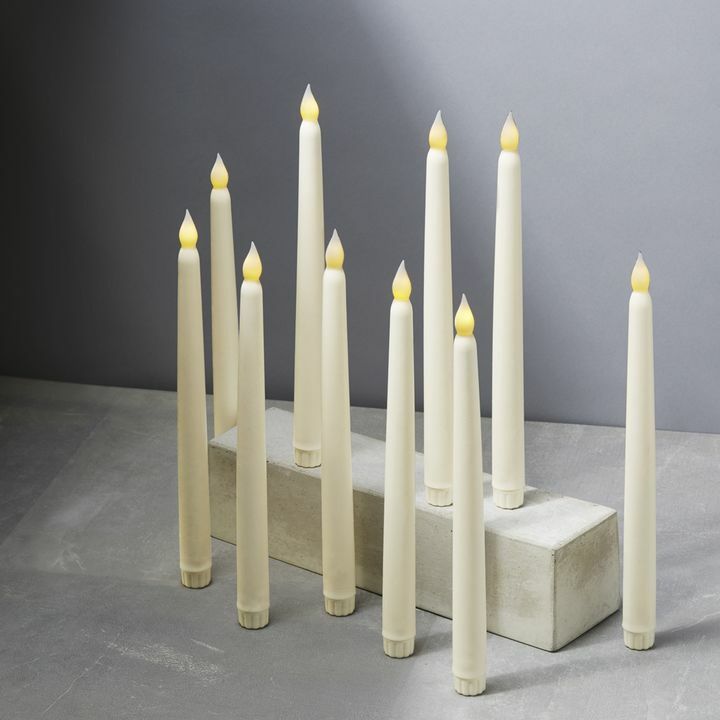 Right now, we don't have any candle holders for candles thiner than a standard taper candle. I'd like to use these in cast iron lanterns with clear glass hurricane chimneys. Will the remote work through glass? 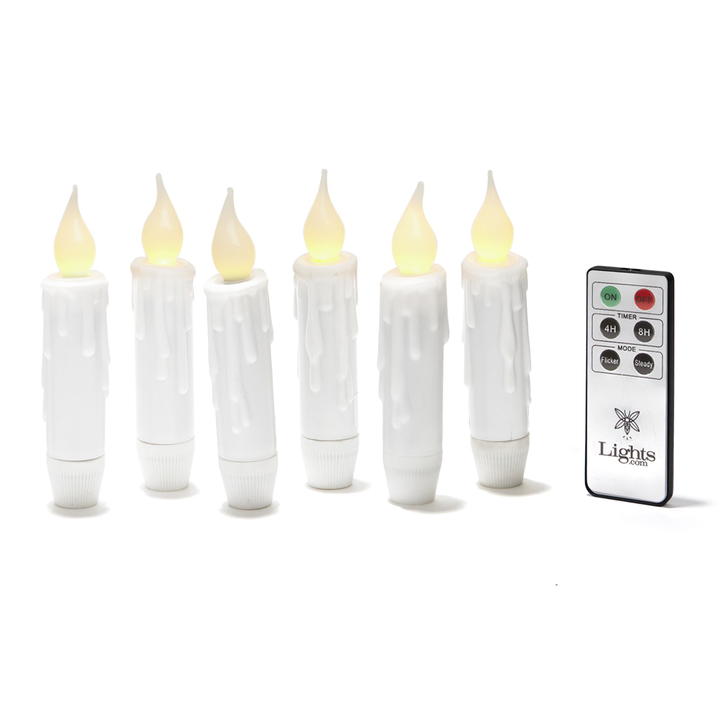 The remote that comes with Smooth White 6\" Resin Taper Candles has a range of about 4 feet. 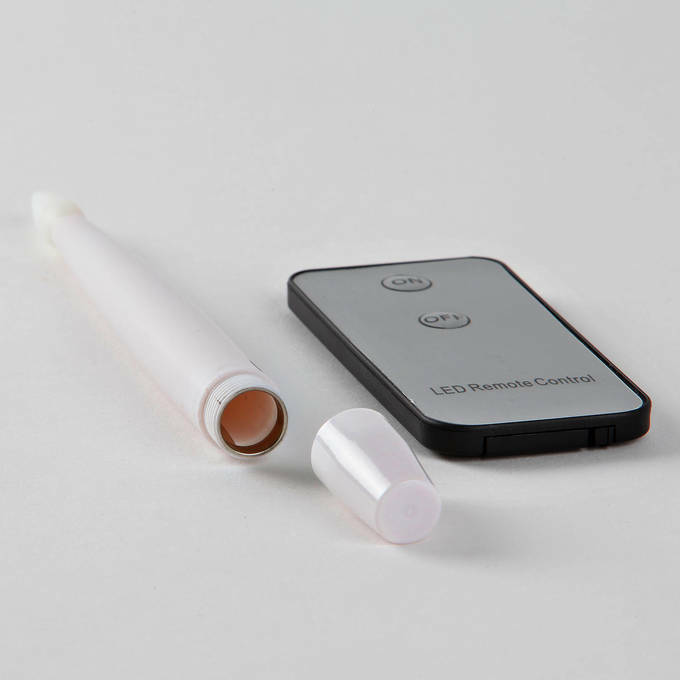 The signal goes through glass pretty well, but keep in mind that it won't go through iron and the receptor for the signal is low in the candle, so that could affect performance. Does the remote work one by one or the remote shuts all of them at once? The remote works by sending out a single signal- that means that if the candles are close to each other, they may all receive them at once. 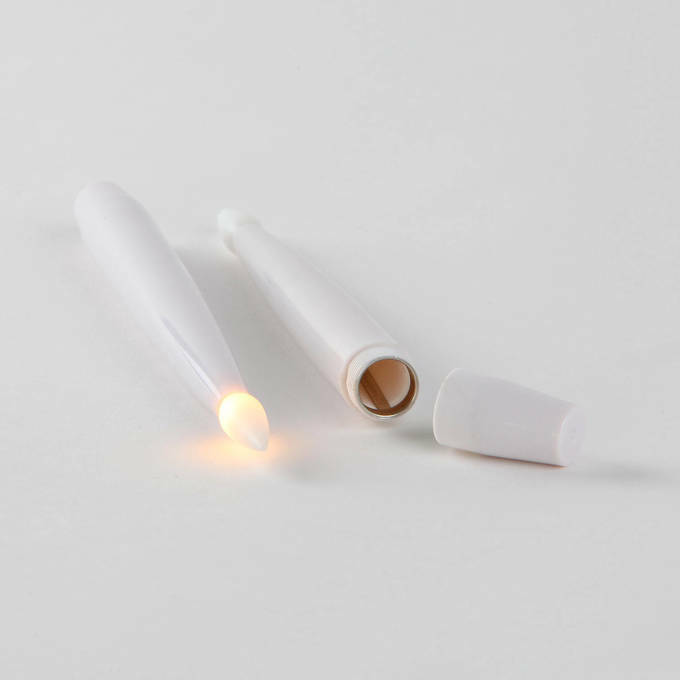 The Smooth White 6\" Resin Taper Candles have a remote range of about 4'.